Leslie Day is the Environmental Science Teacher at the Elisabeth Morrow Elementary School in Englewood, N.J. Leslie developed the City Naturalists Summer Institute, which she taught for 5 years through The Central Park Conservancy. Leslie, her husband, and son are long-time residents of the 79th Street Boat Basin's floating community, where they live year round on their houseboat. She is founder and president of the 79th Street Boat Basin Flora and Fauna Society, which educates the public about the plants and animals of the Hudson River and Riverside Park. If you have comments on the City Naturalist website, or if you want to learn more about the activities of the 79th Street Boat Basin Flora and Fauna Society, write to Leslie Day. 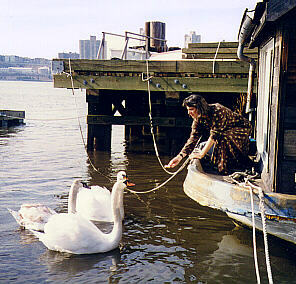 Copyright © 1996-2012 The 79th Street Boat Basin Flora and Fauna Society.